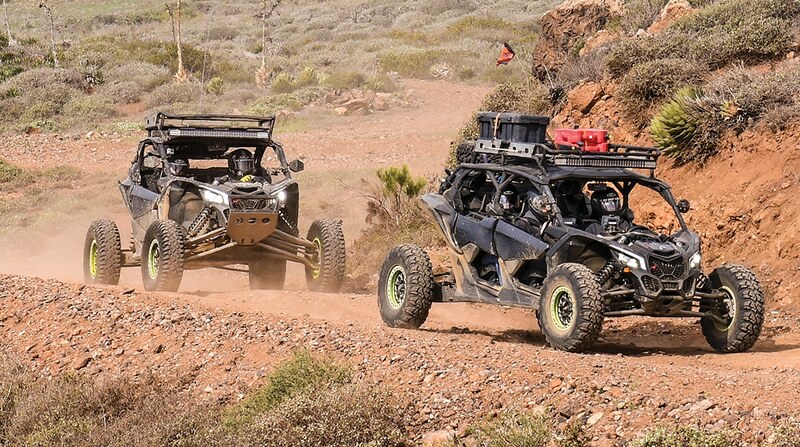 Two-time SCORE UTV champion Marc Burnett spends a lot of time in Baja pre-running for the four-round SCORE series and putting on rides for sponsors. 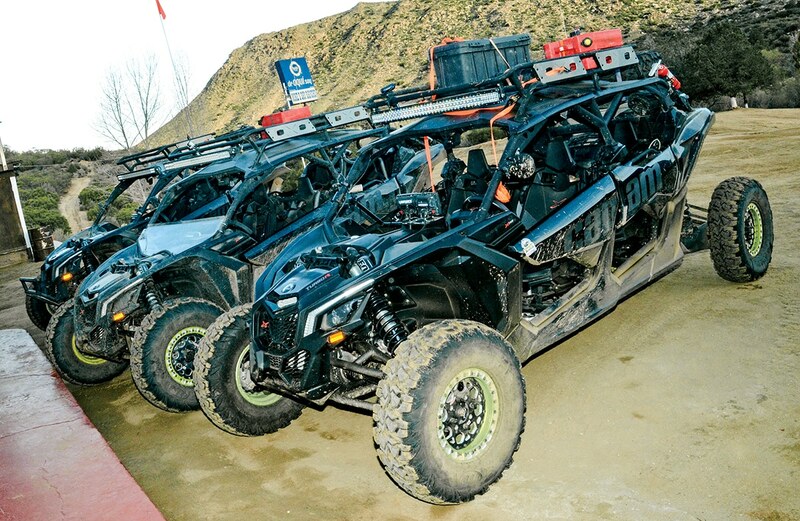 We’ve been on two trips with the Burnett Motorsports crew in 2017 and 2018 Maverick X3 X rs and Max X rs UTVs and had zero issues with the machines. Burnett tests a lot of different products on the these rides and modifies his pre-runner X3s to be more like his race X3s. Here are the modifications he’s done to dial his 2018 rides in. 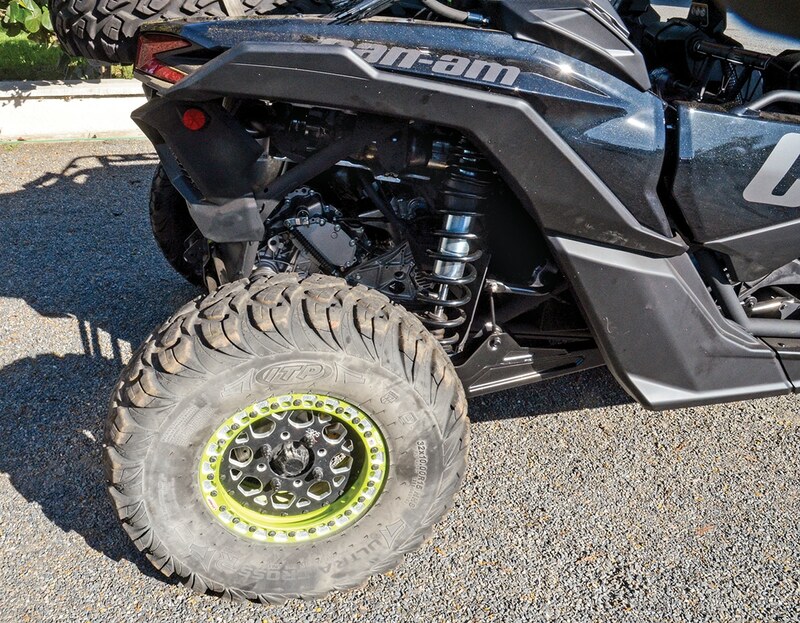 With up to 48 more horsepower than stock and larger-diameter tires, the CVT clutch needs tuning and attention, so Marc uses Airdam clutches in his race and pre-runner X3. Airdam has many options for fine-tuning each CVT to the motor mods, tire size, riding style and personal preferences. They can machine and re-tune the BRP clutches or go to CVTech, Dalton or STM primary and secondary clutches. Mixing and matching can do a lot to change ratios. A CVTech primary and Airdam-machined secondary provides 25- to 26-percent-lower gearing with a super-tight belt pinch. Marc’s X3s use Airdam-machined OEM clutches and engage and lock up almost instantly. It’s abrupt and takes some getting used to, but we had zero CVT issues on both rides (and five X3s). See www.airdamclutches.com or call (601) 883-9929. Marc now runs Evo Powersports exhausts on his race Mavericks but still runs Yoshimura’s slip-on X3 exhaust on his X3 pre-runners. The Yosh X3 slip-on ($999.99) provides a 2.5-percent power gain over stock, but makes much more than that with the EVP X3 Stage 4 kit. The Yosh slip-on also saves weight (19-percent reduction) with a smaller stainless steel can and puts out a throaty sound (93.7 decibels at 3,625 rpm). The carbon fiber cover for the three outlet tips is cool too. See your BRP dealer or www.yoshimura-rd.com. 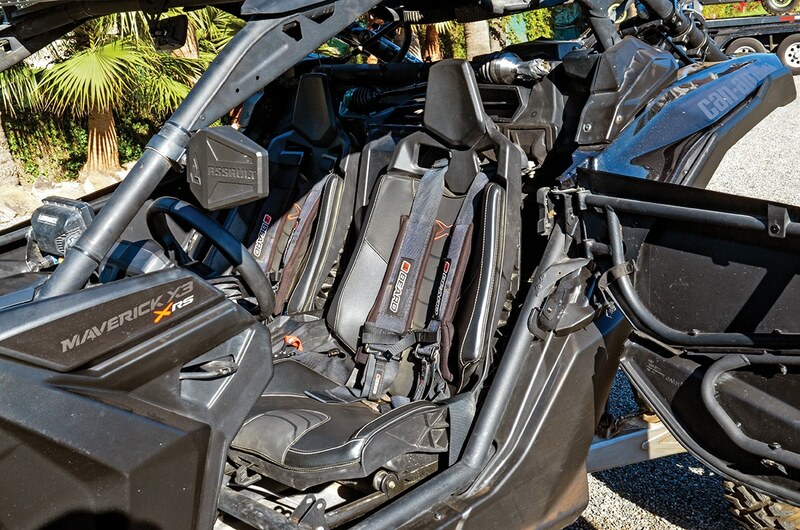 A new-for-2018 X3 fuel-pump housing lets Evo Powersports extract more horsepower than EVP’s 2017 tunes, and Evo has Stage 1 ($549) to Stage 5 ($1149) X3 ECU re-flash kits. Burnett went with Stage 4, which requires 100-plus octane fuel for the 20 pounds of boost with waste gate mods and flow-matched injectors. This mod really wakes up the X3 and X3 Max, boosting horsepower to 220-plus with a full exhaust, and making it accelerate much harder on its way to 100-plus-mph top speeds. 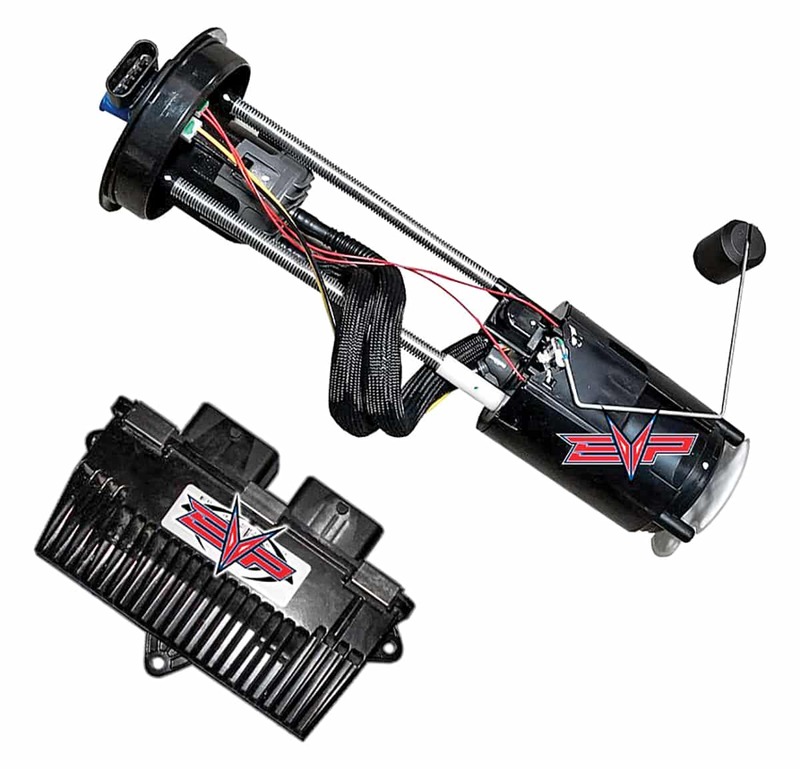 Marc’s X3 and X3 Max pre-runners have the EVP Stage 3R kit ($599), which has 17 pounds of boost, tuning for full exhaust, 9000-rpm limit (up from 8300), linear throttle map, no-brake starting, and a 91-octane fuel requirement. This kit makes 200 horsepower and runs on Pemex Nova with octane booster in Baja. See www.evopowersports.com. Burnett is sponsored by ITP Tires and runs 32x10R15 Ultracross R-Spec on all his X3s. These eight-ply tires have a mounted diameter of 32.3 inches and weigh 39.5 pounds each. MSRP is $221.76 each, but Rocky Mountain ATV/MC has them for $158.88. Burnett mounts every one on an OMF 15×6 billet beadlock wheel with a special X3 offset; each is only 3/8-inch wider than the stock front rim. 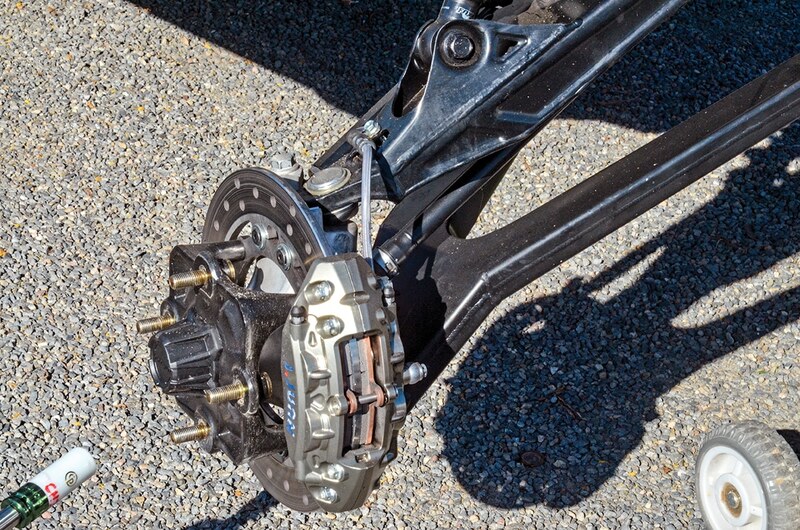 Running fronts on all four corners enhances handling, reduces loads on rear hubs and saves weight. With 32-inch tires, Burnett sets front and rear ride height on his X3s and Max X3s at 16 inches. For 2018, X3 X rs and rc Mavericks eliminate the third rear spring. When increasing spring preload, be sure to measure how much it takes to achieve a 16-inch ride height and then adjust cross-over rings the same amount, front and rear. Burnett feels that the Fox IBP shocks ride in a harsher damping range with the recommended 14–14.5 inches (X3 X ds is 13 inches in the front and 12.5 inches in the rear) of ride height. Although the Maverick X3 X rs and X rc Turbo Rs Marc builds into his race cars sport high-end Fox Podium 2.5 IBP RC2 shocks with dual-speed compression and rebound adjustments, he replaces them with 2.5 front and 3.0 rear Fox Factory Race Series IBP shocks that offer higher-grade components and more tuning options, including high- or low-flow pistons. Front piggyback 2.5s are $799.99 each, while remote-reservoir rear 3.0s are $1,324.95 each; that’s $4,249.88 per pre-runner! 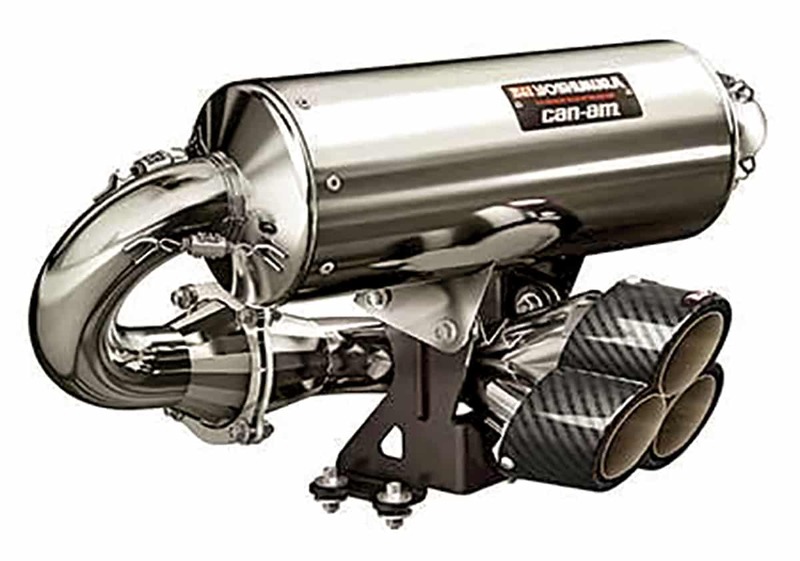 Burnett works with Fox technicians to perfect valving for X3 and X3 Max Turbo Rs. 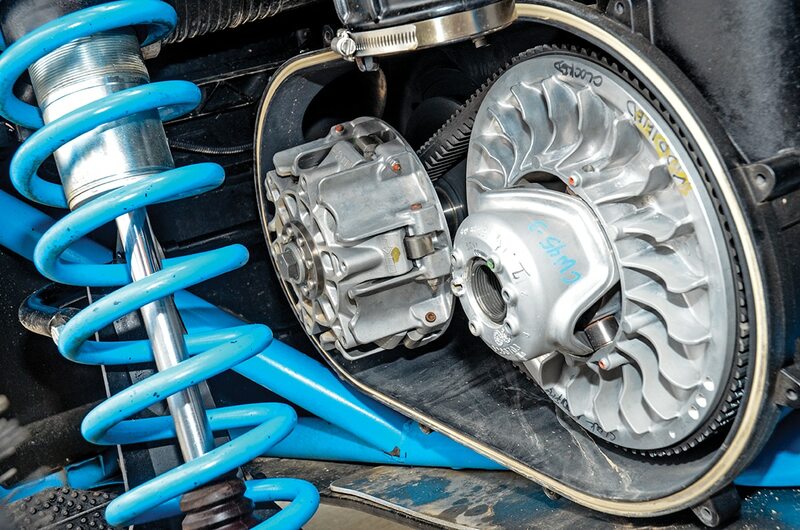 Before clinching the SCORE Forced-Induction UTV Pro title at last year’s Baja 1000, Marc signed with J-Juan, a motorcycle road race brake specialist in Spain. Marc’s X3 Max X rs pre-runner is fitted with billet four-piston brake calipers for testing; he’s working with master cylinders to work with the high-end custom calipers. These calipers lock up the front wheels under hard braking. See www.jjuan.es or www.jjuanracing.com. For pre-running and adventure rides, Burnett fits his X3s with BRP’s Adventure roof rack (Max $549.99). The tubular rack has bottom plates for latching cargo and side plates for mounting work lights, along with multiple front and rear mounts for LED light pods. BRP’s roof racks are very handy for carrying fuel cans, tools and gear bags inside black plastic trash sacks to keep out the dust. See your BRP dealer. Instead of LED pods on the roof racks, Marc opts for Rigid Industries’ E-Series Pro 40-inch spot/flood combo LED light bar ($1,299.99). The extruded aluminum housing and durable polycarbonate lens are Baja-tough, and the 299-watt lights produce 35,680 lumens while drawing 21.36 amps. They throw light out some 2000 feet, which is really good for blitzing the road to Mike’s Sky Ranch at night. See www.rigidindustries.com. 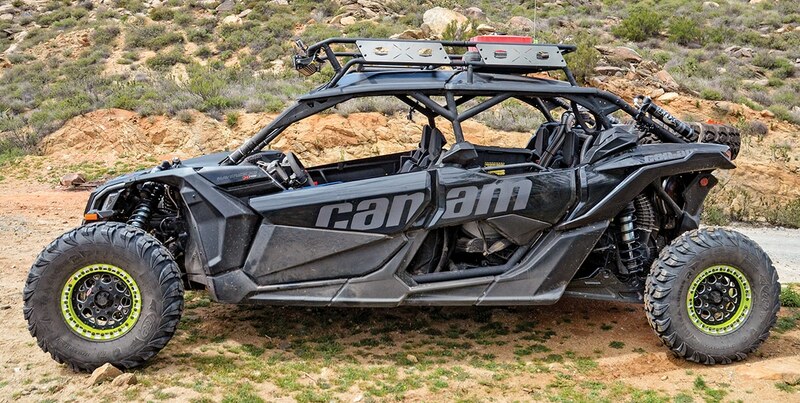 While even the base Maverick X3 and Max UTVs come with a center mirror, Burnett adds a spare-tire mount, which blocks the view. Marc adds Assault Industries’ B2 Bomber side mirrors to his rides to restore rear-view vision. To match the black and Monster Energy Green, Burnett goes with raw bezels; colored bezels increase price from $299.99 a pair to $329.98. The military-grade black anodizing matches the X rs well, and B2s are backed by a limited lifetime warranty and are completely rebuildable. See www.assaultind.com. While most people don’t drive their X3s nearly as fast as the Baja champion, Burnett places serious stresses on his race and pre-run Mavericks. 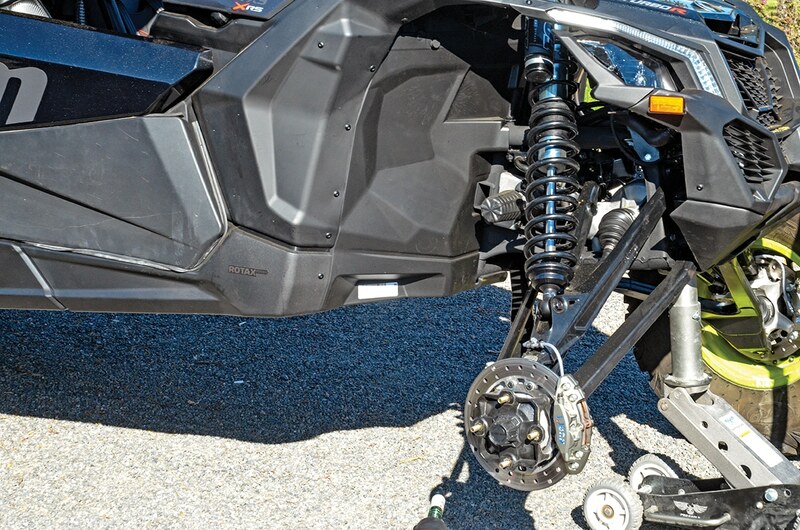 He bends the X rs lower A-arms and has tested several aftermarket arms, including S3 Powersports. For 2018, Burnett is going with LoneStar Racing; look for a full-build test of his LSR King of the Hammers X rc, which he also raced at the UTV World Championships short course. LSR’s X3 XTS HD A-arm kit is $1925. It’s a bolt-on replacement with four 4130 chromoly arms with heat-treated Uniball pins and 7/8-inch Uniballs. See www.lsracing.com. 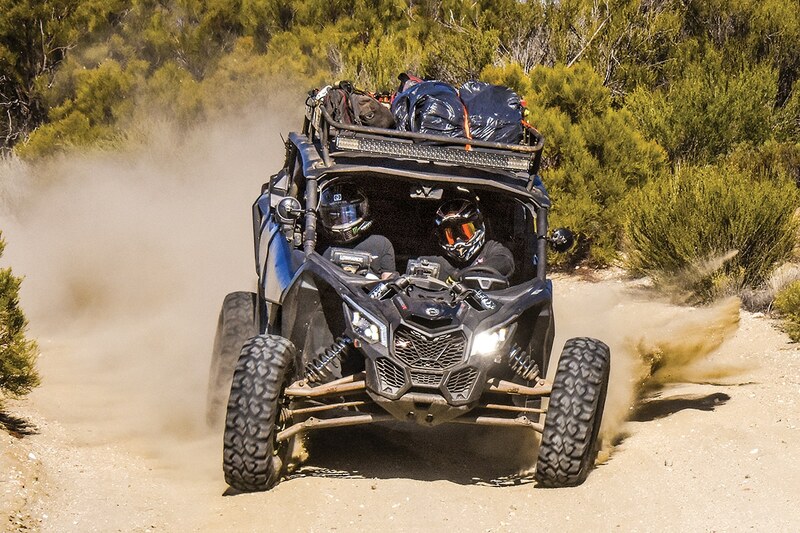 On Burnett’s X3 racers, he runs a Safecraft fire-suppression system; the UTV suppressor runs a thermal sensor on a flexible line to the fuel-injector area and automatically puts out any fires. The 3-pound base starts at $537 and goes up for multiple sensors. Safecraft also has manually activated systems. See www.safecraft.com or call (800) 400-2259. 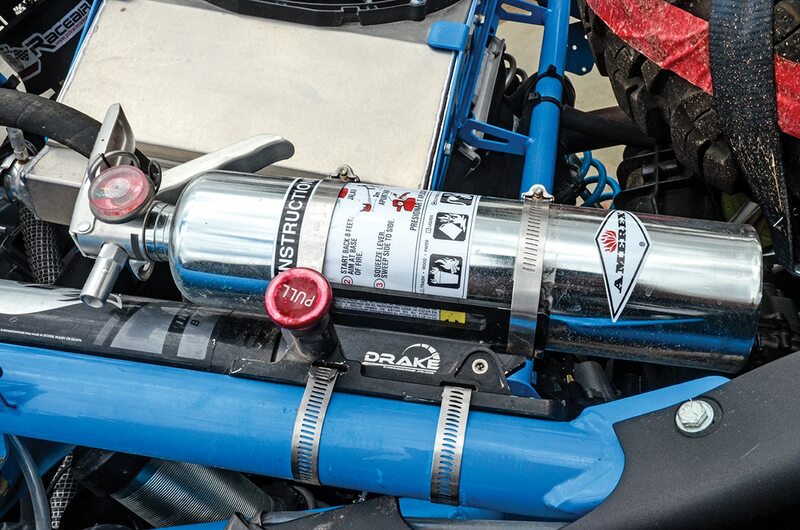 On his pre-runner X3s, Burnett uses a Drake Quick-Release fire extinguisher mount ($64.95, #FIREX-MNT-DAG) and an Amerex B417TC 2.5-pound ABC extinguisher ($95). See www.drakeautomotivegroup.com and www.amerex-fire.com, or go with an Assault Billet Quick-Release fire Extinguisher kit ($169.99).